Welcome to my personel page here I will share all about my personel view on our families five year journey . I am 13 years old, the oldest of my three sisters and one brother . I’m in 8th grade going on 9th. I love baking, water sports and animals . I have a black belt in shotokan karate. I am also a junior life saver and trained in CPR. I love being the oldest because I get to be the one in charge when my parents are out. We are in Nairobi now and my sisters and I will be playing in the millionaire tournament starting tomorrow and am super excited to be given the opportunity to play chess on a large platform. Also my sisters and I started teaching chess to the kids in our apartment complex and it’s really rewarding to be teaching what I have learned. Am trying to do a handstand….just started gymnastics….will blog a picture once I accomplish that. Welcome to my personal page. Here I will share all about my personal view on our families 5 yrs world tour journey. I am 12yrs old and homeschooled. I am in 8th grade going on 9th. I love animals and I love reading too. I was awarded the youngest black belt in shotakan karate in Africa. I worked very hard to get my black belt and so honored to be the youngest in Africa. Also I love swimming and I am a junior life saver….which is awesome! Am also trained in CPR, this is to be able to save someone when the need arises. Wondering what I do for fun? All of the above and gymnastics which is fun I think you guys should totally try it! Our family is all about experiences and adventure. When we arrived in Nairobi one of the first things we did was to find a yoga studio. And this studio is awesome. Great people and clean studio. For those who don’t know what Bikram Yoga is, it’s a 90min yoga done in a very very Hot room. With 26 moves total you get to stretch and meditate all in one. When a parent sign on the kids under 18yrs old practice for free. So there you go we are well on our way to becoming the Yogi family. We practice Yoga 5 days a week. Super fun for the whole family. 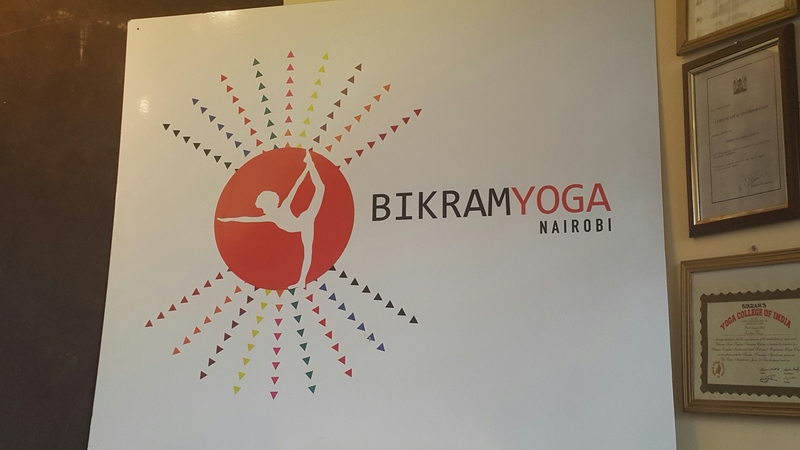 If you visit Nairobi and stay in Lavington don’t forget to check out the bikram Yoga studio. Below are some pictures with one of our amazing yoga Teachers. Can you tell who the teacher is?….LOL!!! Cape Town Train Ride gets off Track! This was one of our funny but yet lesson thought to our kids moment in Cape Town. We did what we always do 3 times a week. by catching the train to go get adjusted by our favorite chiropractor and an awesome family friend. So when we arrived in Cape Town one of the first things we did was have the kids memorize our phone numbers ( Now that must be the rule for your family if thinking of travelling with kids). So I would say about 1 month in Cape Town our kids know both my number and my husbands. So on the Train we journey on to Claremont. On our way back while at the train station to get on and head back home. My husband and my oldest decided to go and grab a bottle of water. So I was with the younger 3 kids waiting on them to return and also get on the train. A few minutes after they left the train arrives so I asked my kids to enter the train while I stand out to make sure that my husband and daughter gets on the train, little did I know that the train only stays at the station for about 30 seconds. As I was standing there the doors of the train closes and I was horrified. With the security people all in shock with me, wondering how my young kids are on the train by themselves and am standing here. I went into a panic mode until Marcus (my husband) and daughter showed up and with all the panic from the people standing by, Marcus said ” honey don’t worry this is all part of the training” I could not comprehend what he was saying but after careful thought I realized its true that’s why we are travelling to teach our kids to be in the moment and carefully critically think of their surroundings when they are placed our of their comfort zone ( this meaning their parents wings). So now I am calm and there we sit waiting on the next train. Marcus phone rings and it was my 12yrs old on the train, she has asked someone to lend her their phone so she can call her parents and let us know that they are ok on the train. So there, I was aware that we are on the right track to creating independent kids. We asked her to go on and sit on the train all the way to the last top which is town. 5 minutes later our train came and we left to go and meet them. When we got to the station they where sitting there with a lady who decided to stay with them until we arrive. We appreciate that. The lesson behind this is place your kids in environment that teaches them to be calm and think. Train ride all the way…. With Nairobi we are yet to find the meals that will excite us. most of the dishes are starchy base just like we have in my home country Ghana. One day I decided to go and visit the local market and it was interesting how it reminded me of Ghana. But what I saw that I have never seen in Ghana is that the Kenyans make Chapati right in the open market. So me being a bread lover it sure made my day at the local market. Also I visited toi market which is also a local market that sell fresh fruits and veggies. Now I feel that place needs an upgrade. when it rain don’t even venture….its muddy and not so much of an adventure you would want. But when its dry and not muddy moments, you are then on the right track to finding great deals on your fresh produce. 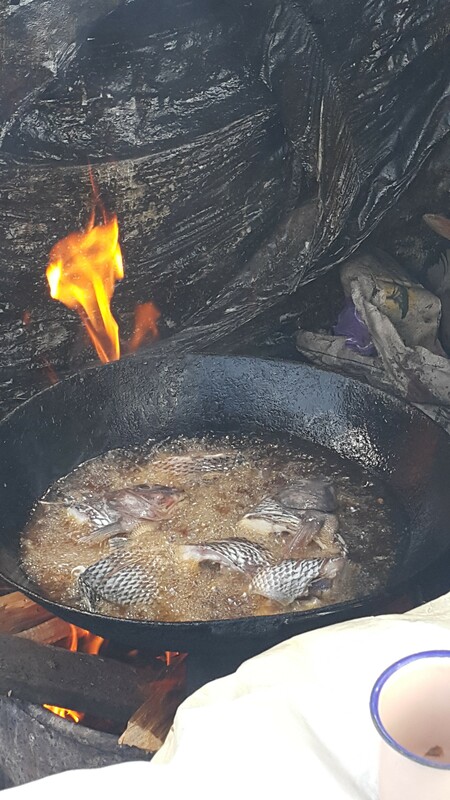 What I saw that I was fascinated about, is this woman who is frying large Tillapia right on the street and it sure looked appetizing since you get to pick the size of this huge fish and she takes the scales off and she puts some salt around the cavities of the fish then she drops it in this scotching hot oil and deep fry’s it for you to take home and enjoy. I had to try one and it was worth the smoke that I inhaled from just standing by the fire waiting on my fish. 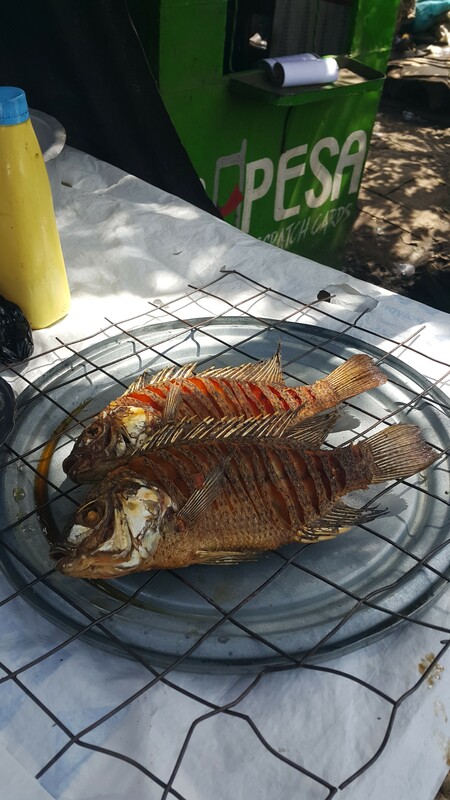 you must try this while in Nairobi. Also I noticed that in Nairobi they had lots of varieties of greens but was not sure how they use it since I really did not see it on the menu at restaurants. Now another food Hunt moment was when I saw men grilling corn by the road side. and what really was new to me is that they will grill your corn and you can dip it in a chili pepper that is just sitting in front of them. That was a big surprising to me. In Ghana our corn is dipped in salt water but in Nairobi its chili all the way. Not my favorite with the chili but I tried it once. While in Cape Town food was one of the things we indulged our selves in. We has so many options to choose from and the price was just right. We shopped at Woolworth, checkers and Spur but any opportunity we go we will buy all our fruits from the Train station. “I know you wondering train station?” yes that absolutely right. At the train station in Claremont while we are going to see our chiropractor we will stop and buy varieties of fruits a price that will shock your system. we will have bags and bags of tasty plums, peaches, nectarines, grapes, bananas, mangoes, Kiwi and our whole price tag will be about $6 which is about 70 Rand South African money. We will consume this fruits for a week and have had enough fruits for our body to stay healthy. We will go out to have lunch and with all of us smiling and satisfied we will only spend $20 (about 236 South African Rand). for a family of 6 being able to spend that amount was just right for us. Cape Town is the place for a great Food Hunt…. Our first month in Nairobi was not easy to adjust to the environment. Especially coming straight from Capetown the city of buzzing activities. We are staying in a great location, called Lavington. walking distance to the famous Junction mall and walking or bike riding distance to most activities. I personally think if you are just visiting Nairobi then consider staying around Lavington area. After a few weeks we started our activities. We hired a chess coach who comes to our apartment 3 times a week to teach our family how to become master chess players ( as they say chess teaches you the way of life….Thinking ahead ). About 5 min drive from our apartment is the Lavington Green Mall that is where we spent most of our hours in the day. We joined the Bikram Yoga class there which the whole family get to practice the art of peaceful moments and also being flexible. ( the saying goes “if you don’t use it you will loose it”). We practice Yoga as a family 5 days a week and so far everyone is enjoying the journey. We also signed our kids up for Gymnastics, as you know with kids jumping without any control can always make their day. We have made great friends in Nairobi now and enjoying play dates and movies days with our new life long friends. We are On the Road to create new experiences and we hope that you will be able to see our experiences through this page. We started our journey On December 1st 2014. We sold most of our household items and moved from our comfort lifestyle to a newer lifestyle. With our 4 out of our 5 kids. our oldest 13yrs old Destiny Manns, our 2nd daughter Aasha Manns 12yrs old, our 3rd daughter IMAHKUS Manns 10yrs old and our 5th child Marcus Manns Jr. 5yrs old. We boarded our flight on November 30th 2014 heading to Capetown south Africa. When we arrived it was a beautiful city filled with great people. We rented a van that took us to our new home which was in Greenpoint. We absolutely loved the area we chose and started making friends right away in our apartment. We experienced true Capetown by using buses and trains to get to all our destinations. After 3 months of making life long friends we had to say goodbye to Capetown and leave for Johannesburg. We spent a couple of days in Johannesburg. After we boarded our flight straight to Nairobi Kenya….that is the 2nd country on our 5 year global tour. On this blogging page we will tell you our story each day while in each country. We will be able to recommend some things to do while in this countries.